If you remember, I talked about the new show Limitless awhile ago, which is co-created by Bradley Cooper. It follows up on the events of Scarlet Johansson’s movie Lucy, in a world where NZT is still very mysterious and unknown, but news is slowly leaking. Suddenly, the FBI is running tests on experimental replacement NZT drugs and trying to devise plans to control a criminal element that is increasingly smarter than they are. The good guys need a new weapon to even the playing field. 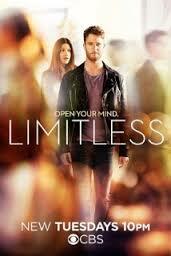 Limitless premiered September 22nd and it is AWESOME! Every bit as good as I expected it to be. There are three things I think set this show apart from the pack. First, it’s super fast pace. The only thing slowing down the events is that the creators have to go slow enough for the audience to catch up, or give us a quick recap. In some cases, the 15 minutes catching up the audience is only a couple of seconds for the main character. Second, this show is smart. It breaks the rules of what we perceive to be the limits, the rules of the universe, and it does so so logically and simply that you feel stupid for not realizing these secrets all along. There are few smart shows on television; Limitless is refreshing. Third, the premise and plot of Limitless set it apart. The supernatural, crime investigation and medical dramas rule your tv screen most nights. Limitless is different. Check it out on Tuesday nights, starring Jake McDorman, Jennifer Carpenter, and Mary Elizabeth Mastrantonio. Guest-starring Bradley Cooper. This entry was posted in television and tagged Bradley Cooper, designer drugs, elizabeth mastrantonio, jake mcdorman, jennifer carpenter, nzt, scarlet johansson, smart television, tv by Hannah. Bookmark the permalink.